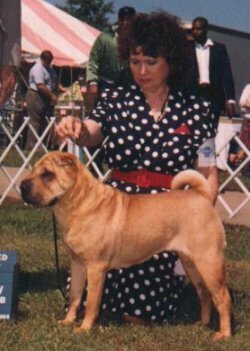 These web pages are lovingly dedicated to the many Shar-Pei that shared a part of their life with me and passed on. Each one was special and left an imprint in my heart that will never be erased. I have loved, enjoyed, taken pride in, and cherished each and every one of them. Because their presence still resides in the dogs here today, they will never be forgotten. So to the dogs whose wet noses woke me up in the morning, whose wagging tail greeted me as I returned home, whose wet kisses told me that they loved me, and whose eyes looked up at me with adoration, I dedicate this web site.